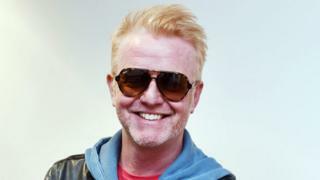 Image caption Evans said the new run would be "short but perfectly formed"
Channel 4 has commissioned a full new series of Chris Evans' anarchic chat show TFI Friday following its one-off revival earlier this month. Eight episodes of the show have been ordered and will air later this year, the broadcaster has confirmed. Evans, recently confirmed as the new host of the BBC's Top Gear will return to present the programme. TFI Friday, which mixed music and chat with stunts and skits, originally ran from 1996 to 2000. A one-off revival of TFI Friday was broadcast on 12 June and featured appearances by former Oasis singer Liam Gallagher, Roger Daltrey and F1 champion Lewis Hamilton. The show drew a peak audience of 4.2m viewers. A short filmed sketch showed former Top Gear host Jeremy Clarkson instructing Evans in how to present the motoring show. Evans was confirmed as the new lead presenter just four days after the programme was broadcast on Channel 4. Image caption The broadcaster said he was likely to "explode on live television due to over excited-ness"
"Chris is the best of the best of live broadcasters and I never doubted for a moment that this TFI would live up to expectations," said Jay Hunt, Channel 4's creative officer. "Confirming a series was a no-brainer." "TFI Friday is indeed coming back for a short but perfectly formed run of eight shows pre Christmas," Evans tweeted on Tuesday. Transmission dates and information about being part of its studio audience would follow soon, he promised. "Oh my goodness, are we really going to get to do this again?" he added in a statement. "Looks like it - and leading into Christmas too. "I might actually spontaneously explode on live television due to over excited-ness.‎ Does that still count as unpredictable cos [sic] I've said it now?" Channel 4 said the show would feature "top celebrity guests, leading music acts and a variety of colourful segments" and would "once again be a key part of the Friday night schedule".